Astronomers say the newly discovered dwarf planet adds to evidence for the existence of Planet X. With their telescopes aimed beyond Pluto to the outer fringes of our solar system, a trio of astronomers has discovered a tiny dwarf planet whose extraordinary path around the sun adds to evidence that a larger, as-yet-undiscovered object is lurking even farther out. The discovery, announced on Tuesday by the International Astronomical Union and described in a paper submitted to The Astronomical Journal, came as part of ongoing efforts to find Planet X, aka Planet 9. That's the hypothetical "super-Earth" or an even larger planet whose existence astronomers have been trying to confirm for several years now. "The discovery supports the existence of a ninth planet — the gravity of the ninth planet appears to be shepherding this new planet ... and other [similar objects] in similar orbits," Sara Seager, a planetary scientist at MIT in Cambridge, Massachusetts, told NBC News MACH in an email. She was not involved with the research. The newfound world is provisionally named 2015 TG387 but has been nicknamed "The Goblin" because it was first observed around Halloween of 2015 and because of the "TG" in its name. Yet even without the Halloween connection, The Goblin seems more than a bit spooky. It's so far away that even through telescopes it's visible as only a dim speck of light, the astronomers said. Preliminary evidence indicates that it's an icy ball about 300 kilometers (186 miles) in diameter with a gravitational field about 200 times weaker than Earth's. If you set foot on The Goblin, "you might weigh as much as a squirrel," one of the dwarf planet's discoverers, Chad Trujillo of Northern Arizona University in Flagstaff, told NBC News MACH in an email. Then there's The Goblin's eerie orbit. Unlike Earth and the other planets, whose orbits around the sun are almost circular, The Goblin moves around the sun in an exaggerated ellipse. At its nearest point, the dwarf planet comes about 65 times the distance from Earth to the sun (a distance astronomers call one astronomical unit, or AU). At the farthest point in its orbit, The Goblin is about 2,300 AU from the sun — about 214,000,000,000 miles. Pluto is about 34 AU from the sun. The Goblin and similar "trans-Neptunian" objects — the astronomers think there could be a million of them — are so far away that they can be seen only when they are nearest the sun in their orbits. "For some 99 percent of their orbits, they are too distant and thus too faint for us to observe them," Scott Sheppard, of the Carnegie Institution for Science in Washington, another of the dwarf planet's discoverers, said in an email. The Goblin takes an astonishing 40,000 years to complete a single orbit, he added. 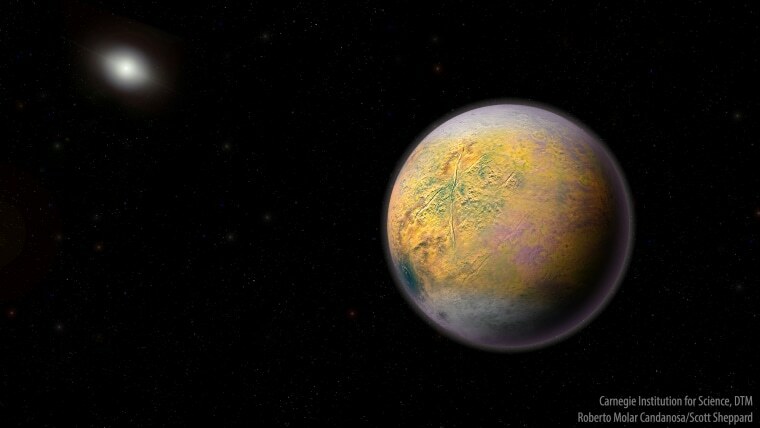 It's The Goblin's long, looping orbit that led astronomers to conclude that the discovery of the dwarf planet lends additional support to the Planet X hypothesis. "Its orbit is similar to the other outermost objects in the solar system," Trujillo said. The objects share an orbital plane that is tilted with respect to the orbital plane of the eight known planets, he continued, and come closest to the sun on the same side of the solar system. "This orbital pattern suggests that something massive out there is affecting their orbits," he said. In a statement, Sheppard likened The Goblin and similar objects to "breadcrumbs leading us to Planet X." "The more of them we can find, the better we can understand the outer solar system and the possible planet that we think is shaping their orbits — a discovery that would redefine our knowledge of the solar system's evolution," he said. The Goblin was first observed using a telescope atop the dormant Mauna Kea volcano on Hawaii's Big Island, with follow-up observations made at the Las Campanas Observatory in Chile and with the Discovery Channel Telescope near Happy Jack, Arizona. And the astronomers aren't done yet. "We are continuing our survey, which is the deepest and largest survey ever obtained for distant solar system objects," Sheppard said. "We will be observing again for Planet X and other distant solar system objects in November."